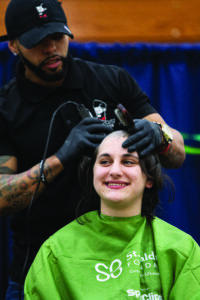 Many female Quinnipiac students may not opt for a buzz-cut, but junior Charlotte Garguilo, has been choosing to shave her head for the past three years at the Student Programming Board’s (SPB) and the Quinnipiac Irish Club’s annual St. Baldrick’s event. St. Baldrick’s has been a nationwide service event since 2005 and has raised $258 million for childhood cancer research. People raise money for this cause through donating, volunteering, being a barber for the shavees or by being someone who is willing to get their head shaved the day of the event. For the past two years and again this year, Garguilo has raised money for St. Baldrick’s and has had her head shaved at the event. For Garguilo, raising money to fight cancer has always been a passion, but she was unable to start participating in a St. Baldrick’s event until her first year at QU. As a shavee on the day of the event, Garguilo sat in the barber chair to get her head shaved bald. Despite the fact that her mother and others are afraid of her shaving all of her hair off, Garguilo is proud and loves the fact that she has been shaving her head in the spirit of raising money for cancer research. Alongside Garguilo’s passion for raising money for cancer research is her own personal connection to how battling cancer can impact an individual and their loved ones. Another reason why Garguilo loves this event is spreading the word about cancer research by asking for donations to support her in shaving her head. Many people, including her friends, admire Garguilo’s willingness to go and shave all of her hair off every year for the past three years. However, despite the praise, Garguilo enjoys and looks forward to the entire aspect of shaving her head for this specific cause.